In addition to rolling out cars with unbelievable power levels, companies have also upped their crate-engine offerings. Crate engines are big business, as more car-builders want to use factory-built new engines instead of having something built. As retrofitting the late model HEMI V-8 into classic Dodge/Chrysler/Plymouth muscle cars became more popular, Mopar started offering ready-to-run crate versions of its latest HEMI. As the competition offered higher horsepower versions of its own crate engines, Mopar wasn’t going to be outdone. 426 cubic inches of modern supercharged engine cranks out 1,000 horsepower. The Hellephant in the room is the newest Mopar HEMI offering. It’s 426 cubic inches of modern supercharged engine cranks out 1,000 horsepower. It comes complete with a wiring harness and ECU, ready to be dropped into just about anything. To add drama and excitement to the launch of the new engine package, Mopar chose to have a 1968 Dodge Charger built. Dubbed the “Super Charger” concept, this modern version of a classic Charger was designed and built by the Fiat Chrysler America Product Design Office (PDO). The car was totally restyled with modern accoutrements and pieces so it looked the part for hosting the new Hellephant crate engine. The Super Charger uses a shifter from a Challenger SRT Hellcat in a custom console, nestled between a pair of Viper bucket seats. 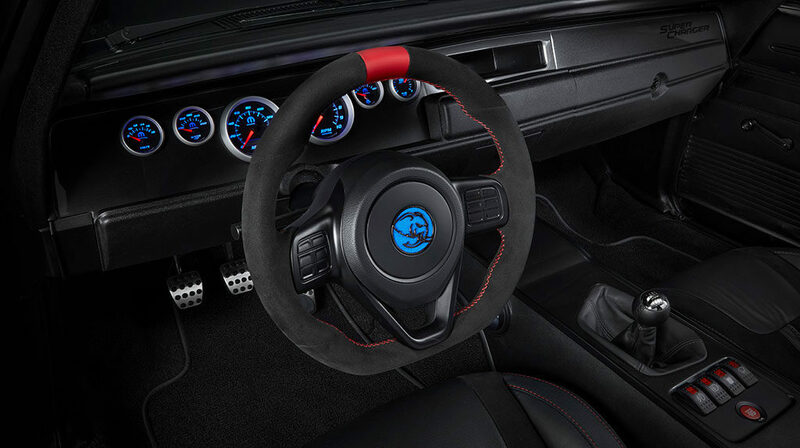 The steering wheel is also from a Viper, fitted with a Hellaphant logo. No surprise that when it came time to select a transmission to send all of that horsepower to the rear wheels, the PDO chose the same TREMEC TR-6060 6-speed manual that is available in the current Challenger. The Super Charger uses a shifter from a Challenger SRT Hellcat in a custom console, nestled between a pair of Viper bucket seats. The steering wheel is also from a Viper, fitted with a Hellaphant logo. The grille features the hide-away lights of the original 1968 Charger, but the headlamps have been upgraded to modern Challenger SRT Hellcat lights. The front wheels are 20 x 11 inches in front and the rears are 21 x 12; styled after the Hellcat’s production wheels. The wheel openings have been tastefully massaged to fit the massive wheels and tires. Front and rear 6-piston Brembo brakes provide modern stopping power. 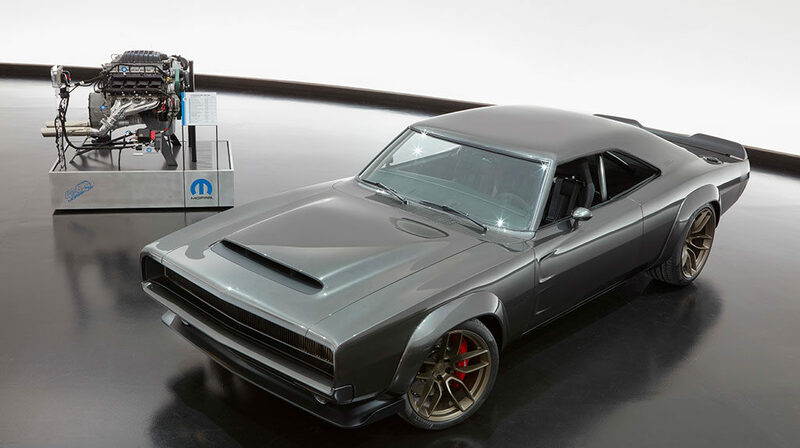 The Super Charger concept is a great example of a classic muscle car updated with modern drivetrain, and we’re proud that a TREMEC transmission was part of the vision from FCA PDO and Mopar.